FIGURE 1-10 Mechanisms of receptor antagonism. A. Competitive antagonism occurs when the agonist A and antagonist I compete for the same binding site on the receptor. Response curves for the agonist are shifted to the right in a concentration-related manner by the antagonist such that the EC50 for the agonist increases (e.g., L versus L', L", and L"') with the concentration of the antagonist. B. If the antagonist binds to the same site as the agonist but does so irreversibly or pseudo-irreversibly (slow dissociation but no covalent bond), it causes a shift of the dose-response curve to the right, with further depression of the maximal response. Allosteric effects occur when the ligand I binds to a different site on the receptor to either inhibit response (see panel C) or potentiate response (see panel D). This effect is saturable; inhibition reaches a limiting value when the allosteric site is fully occupied. A partial agonist similarly can compete with a "full" agonist for binding to the receptor. However, increasing concentrations of a partial agonist will inhibit response to a finite level characteristic of the drug's intrinsic efficacy; a competitive antagonist will reduce the response to zero. 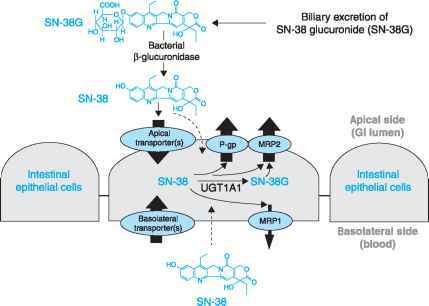 Partial agonists thus can be used therapeutically to buffer a response by inhibiting untoward stimulation without totally abolishing the stimulus from the receptor. An antagonist may dissociate so slowly from the receptor as to be essentially irreversible in its action. 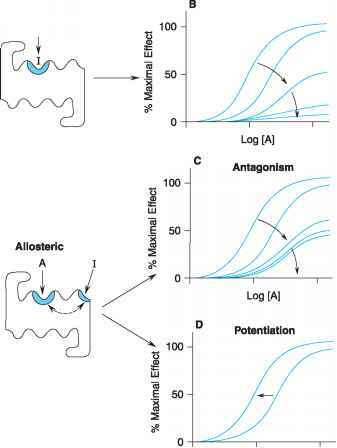 Under these circumstances, the maximal response to the agonist will be depressed at some antagonist concentrations (Figure 1-10B). 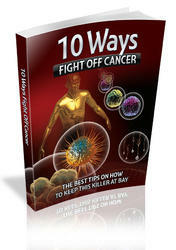 Operationally, this is referred to as noncompetitive antagonism, although the molecular mechanism of action really cannot be inferred unequivocally from the effect. An irreversible antagonist competing for the same binding site as the agonist also can produce the pattern of antagonism shown in Figure 1-10B. Noncompetitive antagonism can be produced by another type of drug, referred to as an allosteric antagonist. This type of drug produces its effect by binding a site on the receptor distinct from that of the primary agonist and thereby changing the affinity of the receptor for the agonist. In the case of an allosteric antagonist, the affinity of the receptor for the agonist is decreased by the antagonist (Figure 1—10C). In contrast, some allosteric effects could potentiate the effects of agonists (Figure 1-10D). For a complete Bibliographical listing see Goodman & Gilman's The Pharmacological Basis of Therapeutics, 11th ed., or Goodman & Gilman Online at www.accessmedicine.com.